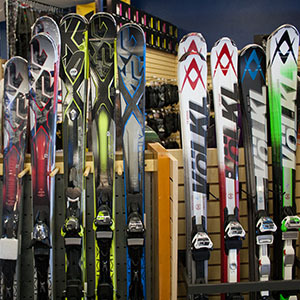 We carry mens and womens skis from Volkl, K2 & Nordica. We have flat skis and system skis and can get you into a brand new pair of skis, with bindings, for as low as $399! When you buy skis or snowboards from us, we will set them up and mount them for free and we will give you free tunes and waxes for the remainder of this season!